Michael Bradley stood midpitch at MAPFRE stadium on Tuesday night, looking equal parts happy and relieved as he spoke to what remained of the red-white-and-blue wearing, chanting and singing crowd of 20,624. “This stadium and these people have bailed us out on a lot of occasions,” said the captain of the U.S. Men’s National National Team (USMNT) minutes after a dominating 4-0 win over Guatemala. It was a game the team absolutely, positively had to win in order remain alive in the semifinal round of CONCACAF-CAF qualifying for the 2018 World Cup in Russia. The men lost 2-0 in Guatemala a week ago, setting up the all-important match. Fortunately, the game was in Columbus and at MAPFRE, where the U.S. men are now 8-0-3 overall, and 7-0-2 in World Cup qualifying games. The U.S. men never, ever lose here, and have beaten arch-rival Mexico four consecutive times by a 2-0 score in what have become known as the Dos a Cero games. Hey, does this make the Guatamala win a Double Dos a Cero? The team “was in sync with the wonderful crowd that pushed them and gave them a wonderful energy,” USMNT coach Jurgen Klinsmann said. In other words: Expect more USMNT matches here. You don’t mess with magic. The USMNT got off to a fast start, as Clint Dempsey scored in the 12th minute and Geoff Cameron in the 35th minute. 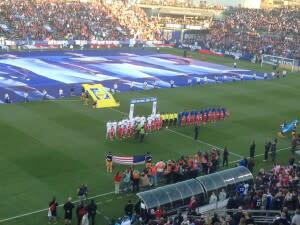 The team continued to attack, and Graham Zusi and Jozy Altidore added second-half goals. Brad Haase drove in from Ortonville, Michigan for the big game with a couple of buddies, and was decked out in a giant U.S. flag, a USMNT scarf and a tall and blinking Uncle Sam hat. “This is my 17th U.S. game,” Haase said, adding he’s been to games in Kansas City, Boston, New Jersey, Chicago and Philadelphia. This was his fifth game at MAPFRE. BTW: Haase brought 30 extra Uncle Sam hats that he passed out to his fellow U.S. fans – and 500 red, white and blue balloons. The plan was to sneak the balloons into MAPFRE under the hats. We’re not sure if Brad succeeded. Justin Craig and Jay Hrdlicka drove in from Peoria, Illinois to attend their first game at MAPFRE. They quickly hooked up with a large tailgating party of U.S. fans. “We heard their American music and came over and hung out, they’re a great bunch of people,” Craig said. They have seen the USMNT team play at Busch Stadium in St. Louis. Just about the only thing that could have made the night even better was an appearance by Ethan Finlay, a member of the Columbus Crew. The fans began chanting “Eth-an Fin-lay” midway through the second half. Klinsmann must have been listening, and Finlay entered the game in the 72nd minute. This was his third game for the USMNT – and his first in an all-important World Cup qualifying game. The place got even louder when Finlay broke free down the left side of the field and scored a goal. But his magical moment was not meant to be. As Finlay raced over to the Nord Deck and slid on his knees, the referee signaled that Finlay was offside. The goal didn’t count. “I don’t think I was off,” Finlay said with a shrug, surrounded by a throng of media that included reporters from the Washington Post, New York Times and Sports Illustrated. Finlay may not have scored his first-ever goal for the USMNT, but he was part of a special night and may have earned more playing time in future World Cup qualifying games. “This is a special place to play,” Finlay said, echoing the sentiments of his teammates, coaches and thousands of USMNT fans.